Machining's Role in Camera Production Modern Machine Shop 91 crucial to get this step right. On the camera parts, dual-action (DA) polishers and Scotchbrite pads bring the finish to the required standard. Despite their large size, the camera parts must be held to tight tolerances—within 50 microns, in some critical dimensions. For both parts, Keller is using a Global Advantage coordinate measuring machine (CMM), a large-envelope system with measuring range of 2,000 by 4,000 by 1,500 mm accurate to within 0.0005 inch. The CMM is programmable and motor-driven, and can scan parts as well as touch-probe them. The scan- ning capability is especially helpful for complex parts like these, says Steve Krengulec, quality control inspector. 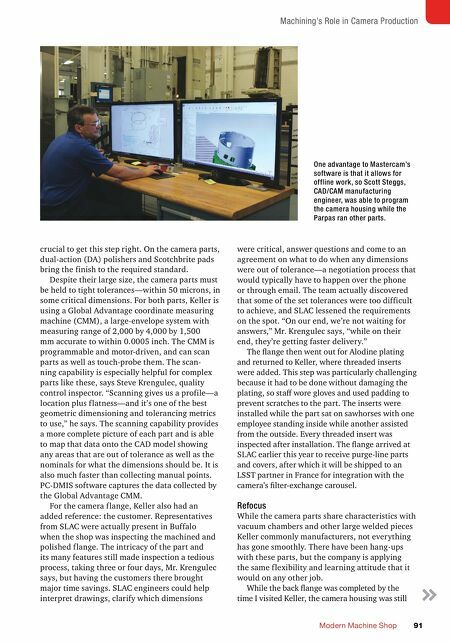 "Scanning gives us a profile—a location plus f latness—and it's one of the best geometric dimensioning and tolerancing metrics to use," he says. The scanning capability provides a more complete picture of each part and is able to map that data onto the CAD model showing any areas that are out of tolerance as well as the nominals for what the dimensions should be. It is also much faster than collecting manual points. PC-DMIS software captures the data collected by the Global Advantage CMM. For the camera f lange, Keller also had an added reference: the customer. Representatives from SLAC were actually present in Buffalo when the shop was inspecting the machined and polished f lange. 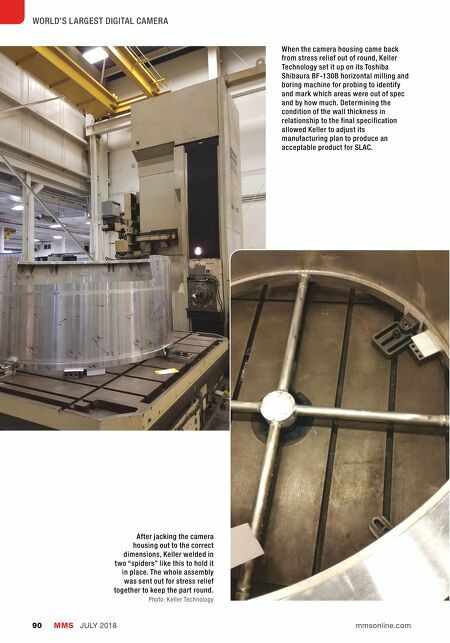 The intricacy of the part and its many features still made inspection a tedious process, taking three or four days, Mr. Krengulec says, but having the customers there brought major time savings. SLAC engineers could help interpret drawings, clarify which dimensions were critical, answer questions and come to an agreement on what to do when any dimensions were out of tolerance—a negotiation process that would typically have to happen over the phone or through email. The team actually discovered that some of the set tolerances were too difficult to achieve, and SLAC lessened the requirements on the spot. "On our end, we're not waiting for answers," Mr. Krengulec says, "while on their end, they're getting faster delivery." The flange then went out for Alodine plating and returned to Keller, where threaded inserts were added. This step was particularly challenging because it had to be done without damaging the plating, so staff wore gloves and used padding to prevent scratches to the part. The inserts were installed while the part sat on sawhorses with one employee standing inside while another assisted from the outside. Every threaded insert was inspected after installation. The flange arrived at SLAC earlier this year to receive purge-line parts and covers, after which it will be shipped to an LSST partner in France for integration with the camera's filter-exchange carousel. Refocus While the camera parts share characteristics with vacuum chambers and other large welded pieces Keller commonly manufacturers, not everything has gone smoothly. There have been hang-ups with these parts, but the company is applying the same f lexibility and learning attitude that it would on any other job. While the back flange was completed by the time I visited Keller, the camera housing was still One advantage to Mastercam's software is that it allows for offline work, so Scott Steggs, CAD/CAM manufacturing engineer, was able to program the camera housing while the Parpas ran other parts.